Visit the Garden Route and be seduced by the glorious natural beauty of this popular and scenic stretch of the south-eastern coast of South Africa. Extending from Mossel Bay to Storms River, the name Garden Route originates from the luxuriant and ecologically diverse vegetation and abundant water features found in this area. It really is a tourist’s paradise, offering awesome beaches, picturesque lagoons, indigenous forests and magnificent mountains. The range of topography, vegetation, wildlife and outdoor activities will gratify all holiday inclinations, whether you prefer to relax and soak up the sun, canoe, surf or hike. The ancient indigenous forests that line the coast from Wilderness to Knysna offer adventure trails and hiking, bird watching, canoeing on the scenic rivers, gliding through the tree canopy or taking a sensual walk through the forest to find a 600 year old yellowwood tree. Wildlife enthusiasts will enjoy spotting brilliant green and red Knysna loeries or maybe even catching sight of one of the shy Knysna elephants, the last remaining forest elephants of South Africa. The Garden Route has a Mediterranean Maritime climate, with moderately hot summers, and mild to cold winters. You can enjoy visiting the area any time of year, depending if you prefer a peaceful retreat during winter or a lively bustling holiday during summer. If you would like to spot the endangered Southern Right Whale which comes into the bays to calve, the best time is July to December. The Klein Karoo is a long valley that lies between the Swartberg and Langeberg mountain ranges, one of the most unique and beautiful parts of South Africa. It stretches along the the Cape Route 62 from Barrydale in the west to De Rust in the east. This semi-arid region is filled with many easily accessible attractions as well as the biggest variety of succulent plants in the world. The Cango Caves, ostrich riding, Gamkaberg Nature Reserve, the Little Karoo Wine Route, Sanbona Wildlife Reserve, Anysberg Nature Reserve and the Klein Karoo National Arts Festival are all excellent reasons to visit the area and will offer you an unforgettable adventure. One of the most interesting natural attractions is the Cango Caves, about 30km outside Oudtshoorn. Proclaimed an historical monument in 1938, the caves were formed by rainwater eroding rock and limestone over 20 million years. 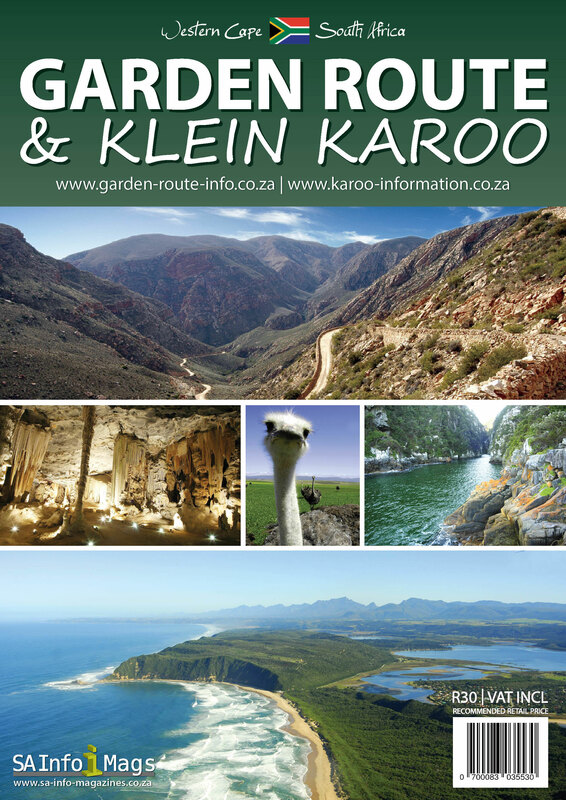 In line with the hospitality of the Karoo, the caves offer tours in English, Afrikaans, German and French. The best way to experience the Karoo is by travelling its back roads and savouring its many moods, vast open spaces and evocative scenery. The Karoo night sky beckons the visitor with a million stars and the dramatic splendour of the Milky Way undiluted by city lights. In this space you can forget your worries and find yourself renewed and recharged. You may wish to bring a telescope to see the magic show of the night skies up close.